Spring Cloud Sleuth which adds Spring instrumentation support on top of OpenZipkin Brave makes distributed tracing trivially simple for Spring Boot applications. This is a quick write up on what it takes to add support for distributed tracing using this excellent library. 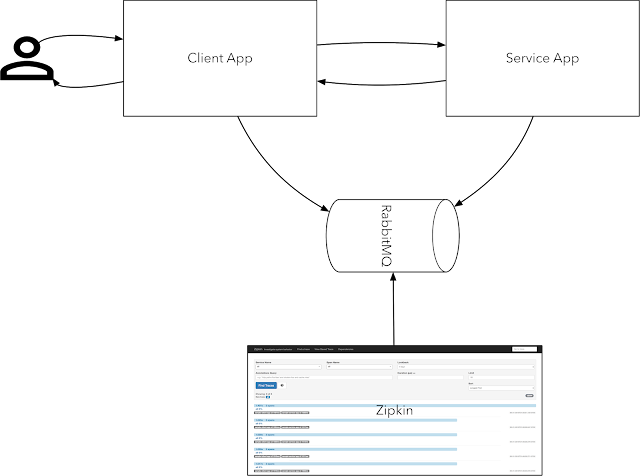 My objective is to ensure that flows from user to the client application to the service application can be traced and latencies cleanly recorded for requests. The sampled trace information from the client and the service app is exported to Zipkin via a queuing mechanism like RabbitMQ. This sample is available in my github repository here - https://github.com/bijukunjummen/sleuth-webflux-sample and can be started up easily using docker-compose with all the dependencies wired in. Zuul 2 has finally been open sourced. I first heard of Zuul 2 during the Spring One 2016 talk by Mikey Cohen which is available here, it is good to finally be able to play with it. Routing based on different criteria - uri patterns, headers etc. My objective in this post is simple - to write a Zuul2 filter that can remove a path prefix and send a request to a downstream service and back. Zuul2 filters are the mechanism by which Zuul is customized. Say if a client sends a request to /passthrough/someapi call, then I want the Zuul 2 layer to forward the request to a downstream service using /someapi uri. Zuul2 filters are typically packaged up as groovy files and are dynamically loaded(and potentially refreshed) and applied. My sample here will be a little different though, my filters are coded in Java and I had to bypass the loading mechanism built into Zuul. It may be easier simply to follow the code, which is available in my github repository here - https://github.com/bijukunjummen/boot2-load-demo/tree/master/applications/zuul2-sample, it is packaged in with a set of samples which provide a similar functionality. The code is based on the Zuul 2 samples available here. It extends "HttpInboundSyncFilter", these are filters which handle the request inbound to origin servers. As you can imagine there is a "HttpOutboundSyncFilter" which intercept calls outbound from the origin servers. There is a "HttpInboundFilter" and "HttpOutboundFilter" counterpart to these "sync" filters, they return RxJava Observable type. There is a magic string "overrideUri" in my filter implementation. If you are curious about how I found that to be the override uri, it is by scanning through the Zuul2 codebase. There is likely a lot of filters used internally at Netflix which haven't been released for general consumption yet. Once the Zuul2 sample with this custom filter is started up, the behavior is that any request to /passthrough/messages is routed to a downstream system after the prefix "/passthrough" is stipped out. The instructions to start-up the Zuul 2 app is part of the README of the repo. This concludes a quick intro to writing a custom Zuul2 filter, I hope this gives just enough of a feel to evaluate Zuul 2.